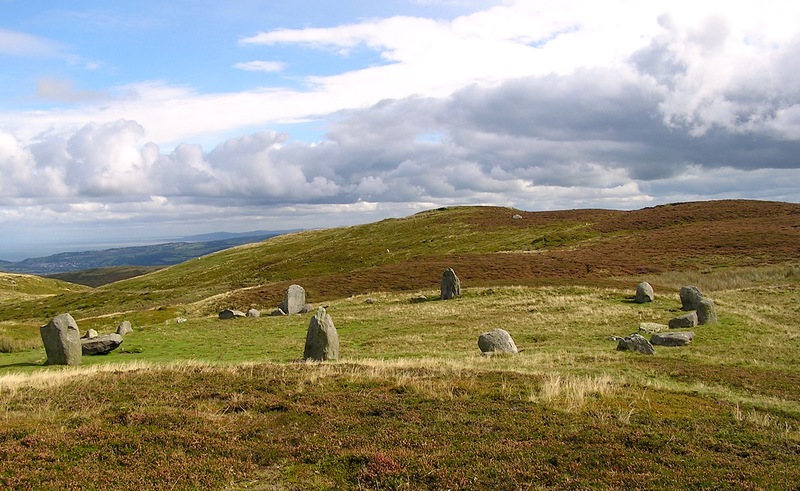 This stone circle sits at 1332 feet in height and features a spectacular vista toward Colwyn Bay and nearby hills and mountains. Two portals are oriented due south, a grave stone is oriented due east, a “swearing stone” is oriented due west, an altar stone is oriented 330 degrees NW, and a large marker stone is oriented 120 degrees SE. A ruined stone circle lies to the west, a ruined hillfort to the southwest, and a little cairn sits on a nearby hilltop. This must have been an important ceremonial center, as a number of chambered cairns, stone circles, etc. are in the area. A visitor told me a legend about the “swearing stone.” A man swore falsely on the stone while touching it and died shortly thereafter. It is a good one half hour walk from the carpark. One follows tracked signs that go through two fences, past a house on the right, and then follows hiking signs to the right. Well worth the effort.